Aerobic Respiration:- Oxygen is required and glucose is completely oxidized with the help of enzymes to carbon dioxide and energy. Anaerobic Respiration:- This process is independent of molecular oxygen. In this process also called “fermentation” glucose is partially broken down. 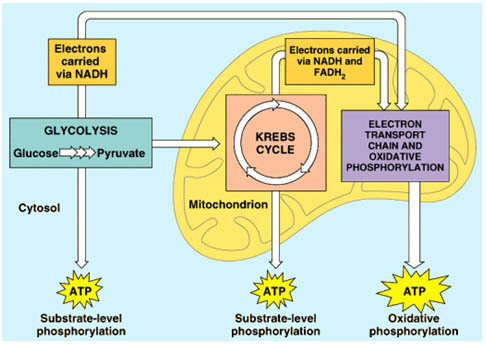 Cellular Respiration:- The process by which glucose is completely oxidized in mitochondrion to carbon dioxide and energy. In this process 38 molecules of ATP (Adenosine Triphosphate) is formed from molecule of glucose.